OR, on a clean counter, spread a thick layer of rye flour and scoop the dough onto the counter, flattening it, using more flour as needed. The dough is very sticky. Once it's flattened out, sprinkle the salt and chopped coconut oil on top. Using a fork or pastry cutter, cut the coconut oil into the dough and then knead it to further combine. Whether you used the food processor in the previous step or not, spread rye flour on a clean counter and flatten the dough on it, using as much flour as needed. Sprinkle the dough with the baking powder and knead it well to combine. 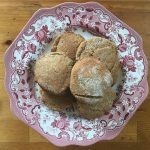 Katy’s rye buttermilk biscuits are very delicious! thanks, Kirsten! what a pleasure it was to share them with you, too. 🙂 let me know how yours turn out.